How To Create a WooCommerce Bulk Discount Per Customer Role or Group? Bulk discounts per customer are particularly useful if you have different types of customers or different pricing strategies to apply. 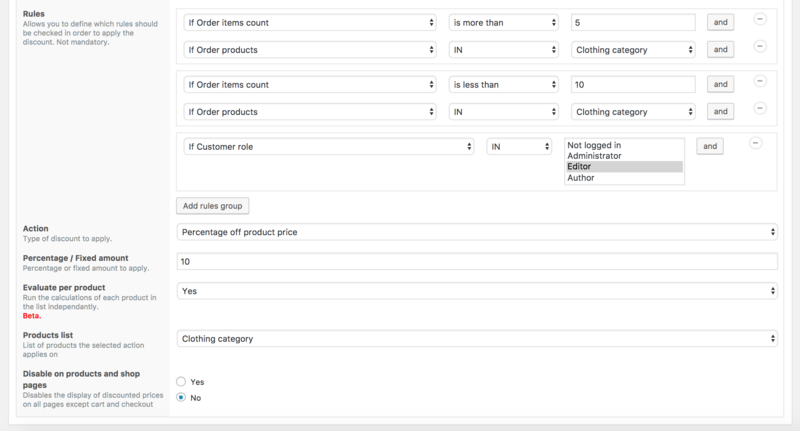 WooCommerce All Discounts gives you the ability to create different bulk discounts for each customer groups depending on their roles or their user group. In today’s article, you will learn how to create a bulk discount per customer role and per customer group in few clicks. How to create a bulk discount strategy per customer role? User roles are the standard user categorisation feature on a standard WordPress website. Let’s assume that you have different customer roles on your website, each of them with specific rights. This is a woocommerce bulk discount demo that will help you create a bulk discount per customer role, we’ll first need to create a products list that will contain all the products we want to target. If you don’t know how to create a product list, please start here. If the customer is a wholesaler AND purchases between 5 and 10 of a product, we need to apply a 10% discount off the product price. If the customer is a wholesaler AND purchases between 11 and 20 of a product, we need to apply a 13% discount off the product price. Now that we agree on what we intend to do, we can now follow this woocommerce bulk discount demo to create our discount. It’s highly important that these two groups are added separately in order to have the plugin interpret each group independently according to our needs. This will allow you to select any existing user role, both default and custom ones added by a plugin. It’s highly important that these three groups are added separately in order to have the plugin interpret each group independently according to our needs. Create a different discount for each interval of your bulk pricing strategy. How to create a bulk discount strategy per customer groups? The main difference between the customers roles and the customers groups is that WordPress only allows one role per user. On the other hand groups managed by the groups plugin are the perfect alternative to create multiple roles for a user. In order to create a bulk discount per user group, just follow the same steps as the “customer role” woocommerce bulk demo but make sure you select “If customer group” as discount condition instead of “If customer role”. This completes our tutorial about the bulk discount per user role and per user groups using WooCommerce All Discounts. If you have any questions, use the comments section to ask.